Intel is planning to launch the Core i7-5775C and Core i5-5675C processors based on the 14nm Broadwell architecture in second quarter of 2015. Detailed by VR-Zone, both processors (part of Intel’s 5th generation desktop family) will feature the power and efficiency improvements added by Intel’s first 14nm process node and deliver relatively lower TDPs with completely unlocked designs to allow overclocking. The two processors which are known as Core i7-5775C and Core i5-5675C are unlocked processors even though they use the “C” series branding unlike the “K” series models which Intel had labeled on their previous unlocke processors. There’s no reason explained for this name change but it doesn’t change anything and the new CPUs are exactly what we had expected to be earlier. The Core i7 and Core i5 parts are going to feature a 65W TDP (Thermal Design Power) and the latest Iris Pro Graphcis 6200 iGPU which has eDRAM cache embedded to feed the execution units with faster memory for smoother execution process as opposed to the system ram which is limited in terms of bandwidth. Starting off with the specifications, first is the flagship Core i7-5775C. The processor comes with a core clock of 3.3 GHz and 3.7 GHz turbo frequency. The chip is a quad core model with hyper threading enabled and features 6 MB of L3 cache, DDR3 memory rated at 1600 MHz native support along with the mentioned TDP of 65W. The second part is the Core i5-5675C which is a quad core model with no hyper threading support and comes with a clock speed of 3.1 GHz base and 3.6 GHz turbo frequency. The model features 4 MB of L3 cache, DDR3 1600 MHz memory support and a TDP of 65W. Both chips house the Iris Pro 6200 iGPU which is a Broadwell GT3e model featuring 48 Execution Units, 64 MB of eDRAM (L4) cache and 128-bit memory interface. Clock speeds for the iGPU on both processors was not determined in the listed specs but can be expected around the 1 GHz mark. 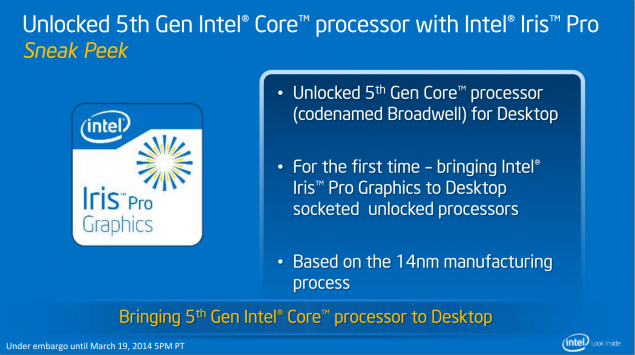 Both processors will be supported by the LGA 1150 socketed motherboards which are readily available in the market. Motherboard makers have already started shipping out BIOS to allow support for the 5th generation of Intel Broadwell processors. The reason Intel may not be moving to more performance minded (95W) parts on LGA 1150 platform could be due to the upcoming Skylake processors which will be running on the Z170 chipset based motherboards whose production is underway and will be available by IDF 2015. While the processors are meant to offer an upgrade to the current desktop parts, they are not going to be a high-performance capable chip like the Devil’s Canyon which was built to handle higher overclocks and featured faster clock speeds. The replacement to Devil’s Canyon comes with Skylake-S in Q3 of 2015. It was previously established by Intel during a demonstration of the processors during GDC 2015 that the sole intention of the new processors is to offer better performance to Mini-PCs and All-In-Ones with the latest BGA and LGA parts. While desktop socketed platforms do good an upgrade path to Broadwell generation, the main performance parts as expected with higher overclocking capabilities will arrive with Skylake generation.